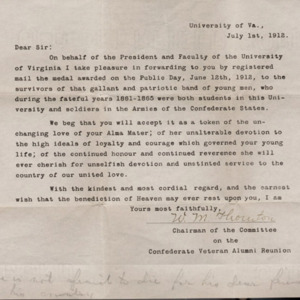 University of Virginia Library Online Exhibits | Program for reunion of University of Virginia students and Confederate soldiers containing roster of surviving Confederate alumni. 1912 June 10-12. Program for reunion of University of Virginia students and Confederate soldiers containing roster of surviving Confederate alumni. 1912 June 10-12. “Program for reunion of University of Virginia students and Confederate soldiers containing roster of surviving Confederate alumni. 1912 June 10-12. ,” University of Virginia Library Online Exhibits, accessed April 24, 2019, https://explore.lib.virginia.edu/items/show/2252.